Eleven years ago, Betsy Ashton returned to the painting career that she abandoned in 1971, when she took a long detour into television news. Three credits shy of a master of fine arts degree in painting from The American University in Washington, D.C., she was an illustrator, artist, and art teacher, who sold many pen and ink, charcoal, and acrylic portraits before creating a program in which she taught art on a local TV program. This quickly led to her reporting and anchoring on radio and TV for nearly two decades, first in Washington, D.C., and later at WCBS-TV and CBS News in New York City. While covering the courts for WJLA-TV News in Washington, she became the first and only TV news reporter ever to draw her own courtroom sketches. Her sketches were shown daily on television and later exhibited and sold by the Jane Haslem Gallery in Washington. 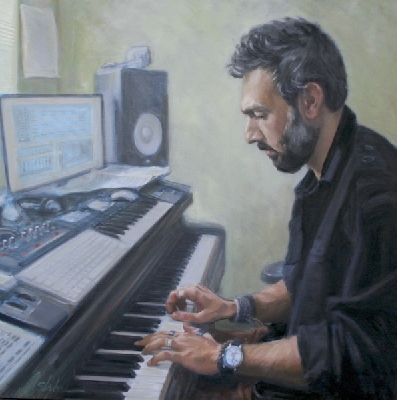 Ashton resumed painting in November, 2006, at the urging of Everett Raymond Kinstler, NA, whose workshops she attended at the National Academy School of Fine Arts and the Art Students' League. She also studied painting for two years at the National Academy School with Mary Beth McKenzie and Sharon Sprung, and took a workshop with McKenzie in Florence, Italy. 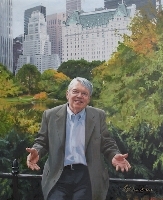 Ashton's portrait of Ambassador Philip Lader hangs in the U.S. Embassy in London, U.K. She painted actor Hal Holbrook for the Hall of Fame Collection of The Players' (club) in Gramercy Park, New York City, and her portrait of author Louise Erdrich is in the collection of the Kenyon Review. Her paintings are in public and private collections throughout the United States, United Kingdom, and Italy. 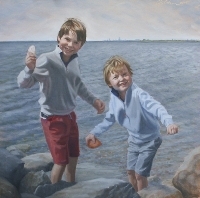 She is a member of the National Arts Club, the Portrait Society of America, The Painting Group, and the Connecticut Society of Portrait Artists, as well as the Long Island City Artists' Association. She is also a longtime supporter of Thirteen/WNET-TV and is frequently seen on-air on public television stations nationwide. I've been sketching everything in sight since I was old enough to hold a pencil, but what I've always wanted to sketch most has been people. When bored in school, I would invariably wind up sketching the teacher. "Betsy! What are you doing?" she would snap, and I would meekly walk to the front of the class and hand over the suspect paper. But upon seeing it, she would change her tone and say, "Oh! May I keep that?" And so I figured that I had a future as an artist. I've always enjoyed and been fascinated by people. As a television news reporter, I loved interviewing an endless variety of subjects to learn not only the newsworthy thing that they were doing, but also what motivated them to do it. Human character is a source of endless interest to me -- it's what makes the world go around. I still interview and observe people to discover and uncover the character within. 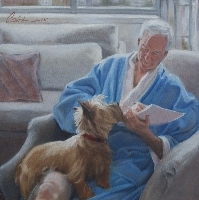 But instead of putting them on video, I now portray my subjects in oils on canvas, producing not fleeting moments, but paintings that capture what I like to think is the essential spirit of the person. It amazes me how the tilt of a brow, the curl of a lip or a finger tip sends a message, alters the demeanor, hints at the thoughts and soul of the person inside. I look for the natural and characteristic gesture, the revealing glance or turn. Then I carefully select a setting and light that magnify the personality, be it moody, mysterious, or sunny and bright. As the painting begins, I revel in capturing the play of light as it slowly reveals the forms and textures, changes colors from warm to cool or reverse. I love the constant selecting and editing -- what shape is important, what line to leave out, what edge to soften or remove altogether? The painting should capture the essence -- the strength, or joy, or sorrow -- of the character, nothing more. I am currently working on a series of paintings and also writing about the hopes and dreams and fears of the subjects -- being both artist and journalist -- to people who are currently being beaten down, but who deserve the honor of portraiture.